SAN FRANCISCO -- More than 30 years after she was abandoned as a newborn in a dorm at San Francisco State University, Jillian Sobol has graduated from the school where she began her life. Sobol, 31, graduated with a bachelor's degree on Friday, the San Francisco Chronicle reported. She was left by a 19-year-old sophomore, who had concealed her pregnancy, in a box in the dorm laundry room on Nov. 5, 1984. "I believe it to be a story of hope, joy, optimism, family and San Francisco State University," said Sobol, who plans to full time at an event production company this summer and is eyeing a future organizing conferences, maybe for tech companies, for San Francisco's Moscone Center, or the city's entertainment commission. After the mother left the baby in the box, the newborn was discovered by a student putting his clothes in the dryer. A baby! He turned, walked into the washing-machine room next door, and asked the only student there: "Did you know there's a baby in a box in here?" the newspaper reports he said at the time. Students shot into action. As luck would have it, Esther Wannenmacher, a studious, 21-year-old nursing student taking a course in newborn care, was in the washing area. She swept her finger through the baby's mouth to make sure her airway was clear. She then unfurled the dirty towels, all the while growing concerned for the baby's bluish color. "Go get help!" she ordered fellow student Patrick Coughlan. "Call 911!" She picked up the baby and cuddled her to warm her. 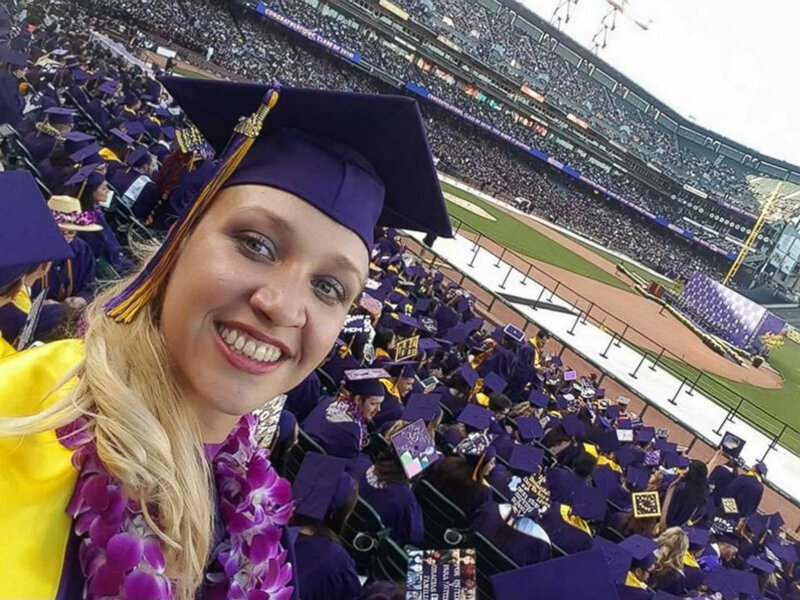 Jillian Sobol, 31, graduated from San Francisco State University on May 27, 2016, over 30 years after she was abandoned there. Years later, Sobol tracked down the woman who likely saved her life. "I really don't believe in luck," said the former student, now Esther Raiger, 53. "This would have to be divine intervention." The baby was later adopted by Sam and Helene Sobol, who had adopted a son three years earlier, and were on the list for a girl. Their new daughter proved outgoing and especially determined. "She would crawl, going after things, ferocious on her hands and knees," Sam Sobol said. But despite her university birth, the idea of graduating from college felt beyond Sobol's abilities for much of her life. "Puberty was tough," the young woman. "I was definitely different from my parents. They were more reserved. Professionals. I was more rambunctious." She had dyslexia, attention deficit disorder and learning disabilities. But she persevered in life, just as she had done in the first hours of her life. She eventually got in touch with her biological parents and her biological father attended her graduation lunch recently. And she earned her diploma. Now she plans to put it to work in San Francisco, the city that gave her a start in life. "I take a lot of pride in San Francisco," she said. "Now, "I think they need my help."